Climate change, and the impacts that it can, is, and will likely have on almost every aspect of our lives, and the lives of all other living things, is the most all-encompassing environmental challenge humankind has faced. As Master Naturalists we well know its implications for our natural world–the oceans, plants, animals, forests, water supplies, weather, etc. As informed global citizens, we also know the economic and social implications climate change has for our infrastructure, coastal cities, agricultural output, fires, droughts, and even migrations of people. As the world struggles to find the way and the will to identify and take the steps needed to try to keep temperature rise from exceeding 2 degrees Celsius, as agreed to in the Paris Climate Agreement, what can we as Master Naturalists do to help to increase the likelihood of success of efforts to address climate change? With our knowledge of the severity of the issue, and the criticality of ensuring that efforts taken to address it are done in a rigorous, and sound scientific and economic manner, and are properly documented and shared with the public, we can help ensure that climate plans, regardless of who prepares them, are credible documents that are likely to achieve what they purport to do. Whether we are part of helping develop a climate plan for an organization we belong to (e.g., a faith community or homeowners association), submitting comments solicited in the preparation of county or state energy, environmental, or climate plans, or responding to plans offered by others (e.g., companies, municipalities), we can provide input that helps ensure that the plan actually stands a chance of doing what it claims to. Just this past July, the Fairfax County Board of Supervisors adopted the Fairfax County Operational Energy Strategy which is “intended to further the objectives of the Board’s Environmental Vision”. Prior to that adoption, a draft of that Strategy was available for comment. The State of Virginia is in the midst of taking input on the 2018 Virginia Energy Plan (comment period closes 8/24) because “The Plan is intended to provide a strategic vision for the energy policy of the Commonwealth over the next 10 years”. These are just two very significant opportunities for Master Naturalists to review and evaluate what is being proposed and offer comments in support of what they find good in the draft plans, and suggestions for how they should, or even in some cases must, be improved if they are to actually deliver climate risk reduction. I recently presented a paper at the Air & Waste Management Association Annual Conference: “A Framework for Credible 2 Degree Celsius Climate Planning”. For those interested in preparing a credible climate plan that will pass muster with those who would challenge its completeness, or who seek a yardstick against which to evaluate strong points and shortcomings of climate plans they wish to review and comment on, this paper offers a checklist of 11 elements that are needed in a credible climate plan. The 11 elements of the planning framework are described, and their relationship to each other is presented in a flow diagram, allowing users to compare plans they are helping to develop, or ones they are assessing, for completeness. The flow diagram also shows how the elements interact with each other, and over time, to deliver results. With 36 years as an environmental engineer with ExxonMobil, I used the petroleum industry as the source of examples of how such planning can be effectively done; however, the framework presented is equally applicable to any climate planning activity. Bill Hafker is a graduate of the Spring 2017 Fairfax Master Naturalist class. We can all relate to the majesty of a mountain or the expansiveness of the ocean. And while many Fairfax Master Naturalists engage in activities that require an “eye for detail” such as counting caddisflies during stream monitoring, it is not always possible to capture the splendor of the life of a caddisfly. Now in its fourth season, PBS Digital Studies and KQED San Francisco offer a series of nature videos entitled Deep Look. These 3- to 5-minute videos cover a wide range of topics, such as how the caddisfly builds a protective home of pebbles using a waterproof “tape”. The photography is stunning, using macrophotography and microscopy (in 4K resolution) providing detailed views of nature that are often overlooked or invisible to us. Decidedly better than our bug boxes with magnifying lid! Episodes offer a topic of interest for everyone. New episodes are offered twice a month (complete watch list). For educators (elementary, high school and beyond), PBS Learning media provides a platform for students using the Deep Look videos. As a professor in public health, I found the episode on ticks fascinating with its images of how it uses its hooks to extract blood and ultimately, spread disease. I will be using it in the course I teach this fall. I encourage you to take a few minutes to observe nature “up close and personal” to gain a deeper appreciation of our natural world and the complexity of lives of even the smallest of creatures. And how our work as Master Naturalists helps in safeguarding nature, no matter how “small”. I have a fairly extensive library of naturalist books and field guides subjects from geology to space to weather to worms to seashells. I even have a field guide to fields! 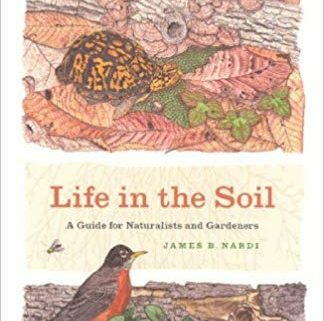 Many of them really don’t lend themselves to being read cover to cover, but Life in the Soil: A Guide for Naturalists and Gardeners, by James B. Nardi, does. This is one of the best, most thorough, and most thoroughly enjoyable books I’ve read on, well, dirt. And everything that lives in dirt. The book is laid out well, much like an outline for a college course would have been years ago. It starts from the general (and most minuscule components of the soil) and moves progressively through to the more specific and larger inhabitants. The first of the three parts of the book explains how soil forms from rocks and organic materials through chemical and weathering processes. The second part is a wonderfully in-depth explanation and description of the members of the soil community and their relationships. The third part covers how we can work in partnership with all of the foregoing to increase and maintain the health of the soil for the benefit of all without chemicals, and how to prevent many of the problems we enable through erosion and the unfettered use of fertilizers. The author’s style is engaging, often humorous, and I feel like he’s talking right to me. He clearly has deep affection and admiration for his subject, and he conveys complex information in a way that is easy to understand without sacrificing the scientific quality. One thing in particular I really like is that the soil community part introduces each new organism with a box that identifies its place in the taxonomic system, its place in the food web, size and its impact on gardens. The illustrations and photos are great, too. The statewide Virginia Master Naturalists website has a wealth of webinars approved for continuing ed. There is often an opportunity for a live webinar. Or, you can review recorded webinars. A wide variety of topics is available, such as: Poisonous Plants in Virginia, Butterfly Identification, overviews of several service opportunities like Virginia’s Big Tree Program, and many more. If you are a master naturalist, you can record your CE hours as VMN Continuing Education Webinar Series. You can also review the classes for Curated Resources and get service hour credit. Good deal. https://fairfaxmasternaturalists.org/wp-content/uploads/2018/07/FMN-stream-monitoring-at-River-Bend-1_Ana-Kaahanui.jpg 576 1024 Marilyn Kupetz https://fairfaxmasternaturalists.org/wp-content/uploads/2017/02/FMN-Logo-300x222-1-300x222.png Marilyn Kupetz2018-07-02 22:21:332018-07-07 02:05:57Looking for continuing education opportunities? I heard about Hoot Owl Hoot from a colleague with a 3-year-old, and I live in a neighborhood with lots of small fry who come visit. A cooperative rather than a competitive game (think oxytocin rather than cortisol) to play with my guests? Eco-friendly packaging? Nature-friendly theme? Fifteen-minute time commitment? Had to try it out. My test subjects over several sessions were one 3-year-old, three 8-year-olds, one 33-year-old, one 56-year-old, and me. 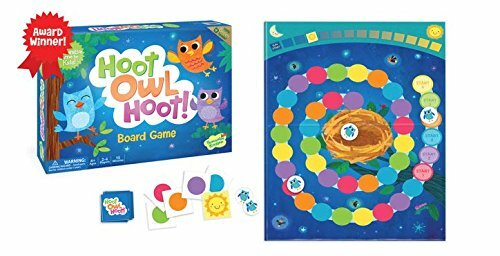 The goal of Hoot Owl Hoot as a game is to help six young owls make it back to their nest before the sun rises. The goal of Hoot Owl Hoot as an activity is to make it possible for the players to help each other help those owls. Because the luck of the draw tends to interfere in competitive games, in this one, any player can move any owl. In fact, the instructions suggest that players be encouraged to talk about their hands and plan their strategy together. The game dynamics otherwise lend themselves to the skills and emotional cadence of pre-school- and elementary-age children and others who are young at heart. No reading necessary as the board and pieces are graphical. Pluses: if you lose a piece, Peaceable Kingdom will replace it gratis. The entire kit is biodegradable. The game reinforces the most central message of the human role in nature and nurture: We are all in this together. 1. All films must be uploaded to Vimeo at https://vimeo.com/groups/456630 and submitted online no later than September 1, 2018. 2. Films cannot exceed four minutes in length, including credits. 3. All films must be produced in 2017 or 2018 and feature the entrant’s relationship with environmental, cultural, and/or historic conservation. The theme is intentionally wide-reaching to allow for diverse creativity, interpretation, and message. 4. All youth submitting films must be age 18 or younger on the day the film is submitted. Actors or interviewees in the film can be any age. If working under the direction of a teacher, mentor, or parent, that person must describe his/her role in detail. 5. Film categories are: Students age 10 & under; students age 11 to 14; students age 15 to 18; and team projects of two or more students (up to 5 persons) age 18 or under. 6. All entries must be accompanied by a submission form including student name, age, mailing address, email address (if applicable), phone number, and title of film. 7. The film must be accompanied by the tagline “This film was created for the American Conservation Film Festival – Next Gen Capture Conservation Contest” in the credits. 8. All videos must be the original work of the entrant. Entrants should NOT use music, graphics, or footage that was created by others without obtaining rights (a license) to use it. 9. Winning filmmakers will be asked to sign a release form granting the American Conservation Film Festival the rights to use, display or distribute the film. The American Conservation Film Festival does not limit the original creator’s use of the work in any way. 10. Entrants can help promote their film and the contest using the hashtag #NextGenCaptureConservation on social media sites. Tick-tock… According to mother nature’s clock, it is tick season again, which means it is time to start thinking about protection and prevention. Ticks are a concern every spring and summer because they can transmit infections that can cause people to become sick. Lyme disease is still the best known and most common disease spread by ticks in Virginia, but there are others such as Rocky Mountain spotted fever and ehrlichiosis. 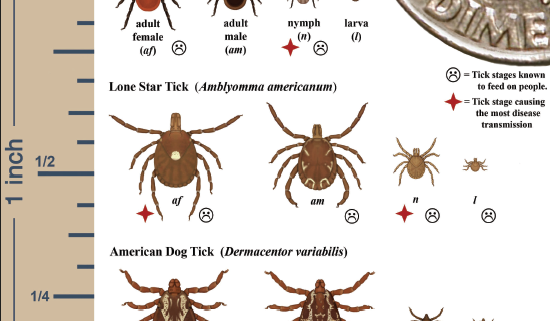 Factors like weather, habitat and the availability of host animals can affect the tick population from year-to-year and make it hard to predict their numbers. “What we do know is that ticks are found throughout our area, so it’s important to take steps to prevent tick bites when you are working or playing outdoors,” says Josh Smith, an environmental health supervisor with the Health Department. Learn about tick behavior, how to avoid tick bites, and more! In his 1984 book, Biophilia, Harvard ecologist E. O. Wilson popularized the premise that people need contact with nature and that humans are inherently hard-wired for this attraction. Since then, the scientific community has reported that humans derive substantial physiological, psychological, and behavioral benefits from interacting with nature. More recently the concept of biophilia has taken root in the fields of architecture and urban planning. Building on the concept of biophilia, Dr. Timothy Beatley (Teresa Heinz Professor of Sustainable Communities, School of Architecture, University of Virginia) suggests that, as people across the globe become ever more urban, making life sustainable requires increasing the density and compactness of urban centers to reduce our energy use and carbon footprint. The task of increasing urban density while simultaneously remaining in contact with nature is such a challenge that Beatley argues calls for a different approach to urban design. He suggests creatively incorporating nature into the daily lives of their residents, an activity already underway in many progressive large cities. To this end, he has spearheaded a project that attempts to link such cities together to help them share their experiences and become even healthier and more resilient communities. The resulting Biophilic Cities Network currently has 13 participating cities around the world, with many more in the application stage in an effort to join. In 2018, Reston officially became the 13th partner community, joining such biophilic cities as Singapore; Sydney (Australia); Wellington (New Zealand); Oslo (Norway); Edmonton (Canada); Portland; San Francisco; Austin; and Washington, DC. Dr. Beatley presented the Reston Association Board of Directors with the Biophilic Cities Network certificate on 22 March 2018. In 2017, Reston Association (RA) charged its Environmental Advisory Committee with the task of assessing and documenting the environmental conditions of the community to establish a baseline against which future changes could be measured. Consequently, the Committee formed a nine-member Working Group [the Reston Annual State of the Environment Report (RASER) Working Group] to undertake this task. Among the group members were six Fairfax Chapter VMN program graduates: Doug Britt, Don Coram, Robin Duska, Linda Fuller, Lois Phemister, and Claudia Thompson-Deahl. The final 2017 RASER was published in July 2017. It evaluated 16 separate environmental attributes of the Reston community, concluding with a postscript arguing that Reston is a biophilic community by design and intent of its founding principles. Reston’s particular way of connecting its natural areas to its residents (through its many walking paths, trails, Nature Center, recreation areas, and education/outreach programs) maximizes such connectivity and promotes more frequent, longer duration, and more immersive interactions. The preservation of Reston’s green spaces also creates healthy viewscapes from much of the built environment. The RASER authors recommended to the RA Board of Directors that they consider applying for inclusion in the Biophilic Cities Network. The Board accepted the recommendation and tasked the RASER Project Director, Doug Britt, with drafting the application. Britt then contacted Dr. Beatley and explained the many ways Reston manages and monitors its natural resources and promotes connectivity between its residents and its natural areas. Dr. Beatley indicated an application from the RA would be given serious consideration. The application involves an official resolution by a city’s mayor (or a community’s primary governing body) stating that the community intends to join the Network and become a biophilic partner community. It requires documenting the key ways the community already is biophilic. It requires a statement of goals and aspirations for the future. It also requires specifying at least five different biophilic metrics that will be collected and annually reported. The successful applicant is expected to share best practices; participate annually in at least one webinar, workshop, or Skype/conference call; respond to requests for assistance from partner communities, if possible; host visits from delegations from other partner cities; attend where/when possible yearly or semi-yearly Biophilic Cities World Conferences; assist individuals and organizational members of the Network; and other expectations consistent with serving as a leader in the Biophilic Cities Movement. There is a nominal $250 application processing fee, and the applicant must identify an individual to serve as the primary Biophilic Cities Network Coordinator. The benefits include the ability to share best practices, lessons learned, and effective policies with other progressive urban communities. It identifies the community as a leader in the international biophilic movement. And it is designed to promote urban development strategies that improve public health, enhance environmental quality, and create a more resilient and productive community. Additionally, ever more large corporations are adopting a biophilic philosophy, creating more productive and healthy work environments, and using biophilic architecture to recruit and retain employees in a competitive labor market. Being designated as a biophilic community may help attract such progressive companies, further strengthening a community’s commitment to see its residents connect with nature where they work, live, and play. There are certainly other communities in the Commonwealth that have biophilic attributes and a desire to protect and enhance their connectivity to nature. It would be wonderful if Virginia could become the first state to have multiple communities designated as partners in the Biophilic Cities Network. 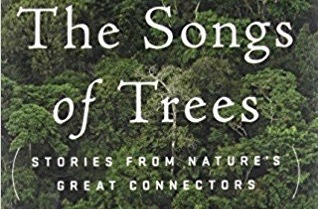 David Haskell’s most recent book, The Songs of Trees (2017, 252 pp) continues his examination of forests and the interconnectedness of organisms. This book, however, is marked by a feeling of particular urgency as he explores not only the natural history of trees, living and dead, wild and cultivated, but the impact of climate change, deforestation, and political pressures on trees, the populations that depend on them, and the planet as a whole. Haskell divides his work into three parts. Part I profiles individual trees and their environments, from the rainforest to the boreal forest; part 2 covers living and fossilized trees; and part 3 introduces cultivated, or urbanized, trees, ranging from cottonwoods to bonsai. Sensors on the trunk of a Bradford pear growing at 86th and Broadway records the rumbles of the subway beneath its roots and the screech and blare of taxis hurdling down neighboring thoroughfares. A ponderosa pine’s melody combines the whine of windswept needles, the grating of a sapsucker probing for ants, the pop of wood cells thirsty for water, the grinding of beetles under its bark. For Virginia Master Naturalists Haskell’s book serves as both inspiration and guide to ways in which we can enlighten and engage the public. By helping people interact with trees and experience them—seeing, listening, touching, smelling, tasting– the trees become animate. When we educate the public on their role as living community centers, we communicate their value and the interconnectedness of all lives. As in The Forest Unseen, Haskell provides fascinating insights into the ecology and evolution of the forest. In this book, human attitudes and ethics vis a vis their environment play prominent and compelling roles. To the Waori people of Ecuador, ”the Ceiba is the tree of life in their creation story “ (p. 16). They view the forest as a whole organism, made up of living things, “spirits and dreams:” that can only exist cooperatively (p. 18). While Haskell believes that few Westerners can match the Waori’s connectedness to their environment, he implores humankind to try harder to interact, learn, and care for the trees and ecosystems vital to our survival. The abandonment of centuries-old olive groves on the West Bank epitomizes the upheaval and loss that occurs when populations are uprooted, due to environmental or political change. A loss, he laments, of both their knowledge and identification with the land. While he addresses the exploitation of both rainforests and boreal forest, which he describes as our last and greatest terrestrial carbon store, Haskell looks for signs of redemption among the devastation. The fossilized redwood in Florissant Fossil Beds National Monument that mesmerizes a young girl and her family is a promise of engagement. Street trees in New York championed by the people who value their shade and flowers give him hope. Like the Yamaki Japanese white pine, a bonsai tended by the Yamaki family for four hundred years and gifted to the US National Arboretum by the government of Japan, trees are “living strands of relationship.” The tree survived the bombing of Hiroshima and is now a symbol of friendship between the two nations. While carefully cultivated and often non-native, bonsai’s miniaturized forms let viewers access trees in a way that is more personal, more intimate. “Trees are masters of integration, connecting their cells into the soil, the sky, and thousands of other species.“(p. 153). Haskell’s book will strengthen FMNs’ resolve to help their communities renew those strands of relationship.